I only recently started wondering about the life of grasses, although I’ve admired them for quite some time – but the reasons why we all must like grass are simple and obvious. Certainly there are a number of scientists and taxonomists, and also zoologists and ecologists who understand the value of grass (there are other people of importance too, but they will appear a little later). The scientific community knows that it is one of the latest miracles of evolution on our planet, and, here’s the other surprise: have literally shaped the way several animals, and in particular all grazing ones, evolved. The first true grazers (i.e., animals subsisting primarily on grass year round) are no more than 10 million years old, and a predominance of tropical grazers as is familiar to us in Africa today has a history of only a couple of million years (Janice, C. M. 2008). Grasses not only helped a group of animals evolve, they also helped them outcompete with others, and so it was one of the few that helped change the history of Earth (from tooth to gut, literally). But I wouldn’t mind calling it the only one that revolutionized our life and made us what we are today. Rice. Wheat. Barley. Oat. Rye. Maize. Sorghum. Sugarcane. Bamboo. They are all one of the most important crops grown worldwide, and form a major part of the diet (or serve as other resources) of many regions. They’re found in every home, and they are all grasses. On a trail you take through the woods, grasses dominate the ground flora in several places. On a walk along the concreted pathway, you may notice but unintentionally forget to remember the grasses that take root in the most inhospitable of anthropomorphic environments. My association with grasses, and indeed of most, if not all, naturalists’, was never direct. It is only when we see a caterpillar of a butterfly which feeds on grass, or a bird which picks up the grains, do we acknowledge grass, but never with just as much awe as we would the subject that feeds on it. It was no wonder that I found grass, which is the most commonest of all in all the places I’ve been to so far, to be, ironically, the most difficult to identify and appreciate. But let us leave taxonomic identification of grasses with the agrostologists. There are some subtle cues which help us study (and in the process admire) the life of grasses – their life is simple, but we often miss when they sprout, blossom, fruit, and die. In the context of Monsoon in the Sahyadris, we’re going to trace this subtle aspect of grasses. Grass at the beginning of monsoon is like grass at the beginning of spring – dry, dusty, and dissolute. It breaks as you brush by and crumbles into infinite specks of dust. All along the steep slopes and rocky cliffs grasses are seen as drab brown carpet for the most part of the winter and summer months. They add a touch of desolation and a sense of inhospitality to the place. The early monsoon rain greets the Sahyadri, and just as suddenly, without one’s notice, little buds start taking root. The grasses, as is the law of nature in the Sahyadri, are always preceded by the ephemeral orchids, lilies and other herbs. The forest floor is full of them for the month of June, and the first half of July. As they begin to fade away, it is grasses that mostly dominate the landscapes thence. By mid-July, the landscape is lush green. The monsoon ephemerals mingle with the grasses, and they both combine different hues of green-and-blue to form an enigmatic mottle of dark and light patches. The colours are so vibrant that they seem to glow in the moonlight too. The monocultures of grass, especially of rice, are saturated with water which has aided in rapid growth of the crop. The growth pattern of grasses is not constant throughout the Ghats. They are now well over ten inches tall in some places, while in others they’re barely over two inches off the ground. Certain species grow extremely swiftly, and cover hillsides in isolated or dense bushes. In the middle of monsoon, when most of the ephemerals have completed their life, the grasses, along with ferns, balsam and begonias, have taken the lead. They now dot every part of the ground they can possibly cover. Grasses are sturdy and can take root in the smallest crevices in rocks without soils. The large basaltic outcrop at Kanheri Caves in Sanjay Gandhi National Park is one of the best places within the city limits to observe grass, just as you would observe butterflies and birds on a walk in this protected area. As we near the end of monsoon, the weeks from August to September sees a rather swift growth in grasses. It may be that we never noticed them when they were young, but now they’re in their prime, and having reached the maximum size – in some up to ten feet in length, they’ve begun flowering. Coix is one of the large, beautiful genera of true grass common along the foothills of Sahyadri, especially along the Konkan coast. Grasshoppers and Earwigs are fond of its leaves and inflorescence, and devour them with delight. In October most of the grasses have spent their energy successfully. They’ve flowered, and, with the aid of wind and insects, have been successfully pollinated, mated and produced seeds. Some already turn brown, while others last a little longer until the sun saps all the moisture from the surface of the earth. And so we come to the end of one of the billionth lifecycle of grasses. In winter, however, the grasses that are half dead, take another avatar that lasts only in the wee hours of morning. The early mornings of the ephemeral winter in the Sahyadri are ideal for dew formation. And grasses are aplenty, and apt, for their grandeur display. And so grasses give just as wonderful a view as they did a few months ago during monsoon. But summing up the life of grass in a mere four paragraphs does not do justice to the life they’ve led. There are several factors, atmospheric and biological, that occur. There are interactions at all possible niches, between all possible animals, before grasses take a long rest until the next monsoon. The human-grass relationship is one of the strongest in the world. In the Sahyadris where every puddle is filled with rainwater, our thousands of years of agrarian culture have taught us to dam the water, and plant rice. This, I think, is closest a man can come to monsoons and grass. The interconnection is very close, but also very vulnerable. A little shift in the monsoon pattern and the paddies may fail. For instance, rice is especially vulnerable to the last phase of monsoon. As most varieties of rice fruit around August, the hot and dry phase of September and October are crucial for harvesting and storage of the grains. If the rains continue to lash through, the crop may begin to decompose prematurely, leading to a phenomenal loss. Grass, however, is not just food for us. It is fuel for our fire, furniture for our homes, a shelter on someone’s head. But ecological benefits of grasses surpass all of its economic services. Indeed, if you deduce all of the grasses’ ecological benefits into monetary terms, grasses surpass everything man has ever built himself. For starters, they hold soil in place, they help retain moisture and water, they control the ambiance of a place, and they provide nutrition to birds and mammals, domestic and wild alike. Grasses share a closer bond with the elements of nature and animals such as insects and birds for its survival. Many are anemophylus: the wind carries the pollen across the landscape, successfully planting several and thus aid in fertilization. Some are cleistogamous: they are self-pollinating. In some species, especially that of rushes, insects like flies, bees and beetles also aid in their pollination. One of the common visitors of sedge (family Cyperaceae), are the flies. I’ve found flies in the genus Eristalinus, family Syrphidae, to be the most common visitors of grasses during the months of June and July. Besides flies, beetles in the family Chrysomelidae and Elateridae are also commonly seen on grass inflorescence. Even in death, Grasses are crucial for birds to build their nests with, and provide seeds to feed on. Harvester ants exclusively feed on the grains gathered from grasses. It is why they are called Harvester Ants. The husks and other remains of the grass are quite systematically discarded in one place outside the nest. Yet as with everything, grasses look their best in monsoon. A simple and dainty sedge which grows along the Sahyadri is Trachelostylis lawiana. It prefers pasture fields and disturbed habitats. This endemic sedge is locally very common, but its preference to secondary habitats, where it is subject to extensive grazing by domesticated animals, is quite surprising. Its growth is perhaps propelled by the grazers that keep the landscape trimmed, which would otherwise grow into long and dense grasses measuring one or two feet in length, impeding the growth of the little Trachelostylis, barely measuring four inches. The grasslands all over the world are a subject of grazing by domestic animals, burning, and, quite paradoxically, tree plantation drives. Grasslands happen to be one of the largest ecosystems, and are the most underestimated and exploited in the world. Most of the grassland habitats along the Sahyadri occur over the Deccan Traps and the hinterland. The very few ones of the Konkan plain have been converted into paddies, and the ones on top of the Traps are being converted into “forestland” by planting monocultures of trees. This was especially the case on the “bare” mountains – mountains that were once dominated by grasses. These monocultures replace completely the native ecosystem with, more than often, the exotic plantations. And as years go by the resident grasses are replaced by more resistant species of grasses. Another kind of monoculture is related to our food. Fields of grains and especially sugarcane also have a devastating effect on the biotic as well as abiotic factors of the region. In the month October in 2011, I had the opportunity to visit the Krishna River Basin in southern Maharashtra, just up the Deccan Trap where the peninsular plateau begins. The plains here are extremely rich, and therefore sugarcane is a booming industry, however, sugarcane being a nutrient intensive crop, the land has been spoilt by fertilizers like urea, and has rendered them useless when it comes to growing other crops. The biological diversity of this region is as a matter of fact quite poor. Only a few birds like the Baya Weavers, who are an adaptable bird species of the Ghats, and others that rely on small wetlands, reside in this region. When I think about grass now, I think of it not as a gift to mankind, or to the wildlife, but of priceless value for many of the terrestrial animals. I see grass as food for the tiger as much as it is for us. Grass has found its mark on planet Earth by being one of the simplest, yet the most resilient of all the flora and fauna of the world. It is one of the edifices of our planet. It is a plant that will be the first to grow on a land exploited for its resources by man, yet lands devoid of trees are not wastelands just because only grass grows on it. Grasses have had a mark on me, thanks to their omnipresence, and thanks to people who’re helping the lost prairies grow back on sand mines, who’re doing every bit to save the grasslands, and who’re digging deep to discover new ones. Many of the flagship species of India, such as the Great Indian Bustard, the Florican, the Wolf, and the Striped Hyena, all exclusively rely on grasslands. 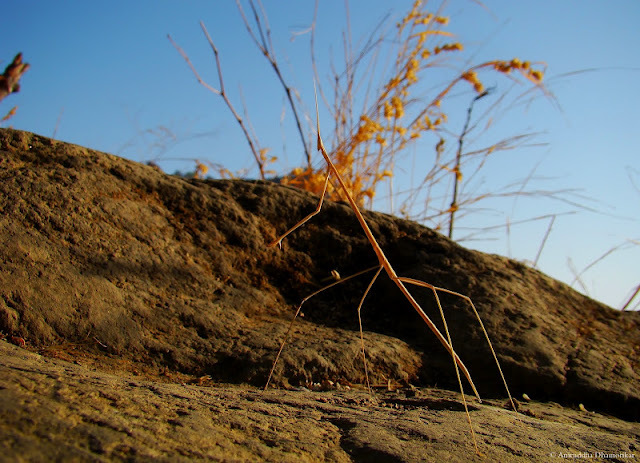 On the treks in the Sahyadri, you’ll see that it is grasses that are the most dominant in numbers of all living things. And indeed they must be, for along Sahyadri’s steep slopes and lose soil, where no tree can get a hold, it is grasses that keeps the mountains from crumbling. What a very interesting post this is. Certainly made me think about grass differently. Amazing how we take such an important asset for granted. With climate warming it seems that the grass here in England now grows all the year round. This it not just my imagination either. My lawn mower is kept busy even in the winter months sometimes. I'm very curious to know what goes on up so far from the tropics. Certainly the happenings because of climate variability are more apparent there than over here.